Ever been to the Galapagos Islands? No? Well then this post is the second best thing! Read on to learn about GA and implementing them in R.
What are genetic algorithms (GA)? The GA process and its operators. Imagine a black box which can help us to decide between an unlimited number of possibilities, with a criterion such that we can find an acceptable solution (both in time and quality) to a problem that we formulate. Genetic Algorithms (GA) are a mathematical model inspired by Charles Darwin's idea of natural selection. Natural selection preserves only the fittest individuals over generations. Imagine a population of 100 rabbits in the year 1900. If we look at the population today, we are going to see rabbits that are fastes and more skilled at finding food than their ancestors. Every possible solution of the GA, i.e. the selected variable, is considered as a whole, thus it will not rank variables individually against the target. And this is important because we already know that variables work in groups. One solution can be picking up three variables, let's say var2, var4, and var5. Another solution can be var1 and var5. From the image, Solution 3 can be expressed as a one-hot vector: c(1,0,1,0,1,1). Each 1 indicates the solution containing that variable. In this case: var1, var3, var5, var6. While Solution 4 is c(1,1,0,1,1,0). This combination follows the basic GA operations, which are selection, mutation, and cross-over. Selection: Pick up the fittest individuals in a generation (i.e. the solutions providing the highest ROC). Cross-over: Create two new individuals, based on the genes of two solutions. These children will appear to the next generation. Mutation: Change a gene randomly in the individual (i.e. flip a 0 to 1). The idea is that for each generation we will find better individuals, like a faster rabbit. 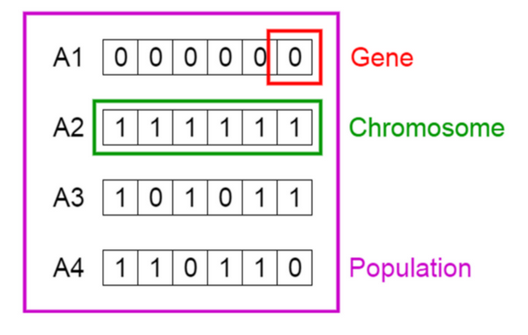 I recommend the post by Vijini Mallawaarachchi about how a genetic algorithm works. This objective maximization is, for example, to keep with the solution that maximizes the area under the ROC curve. This is defined as the fitness function. 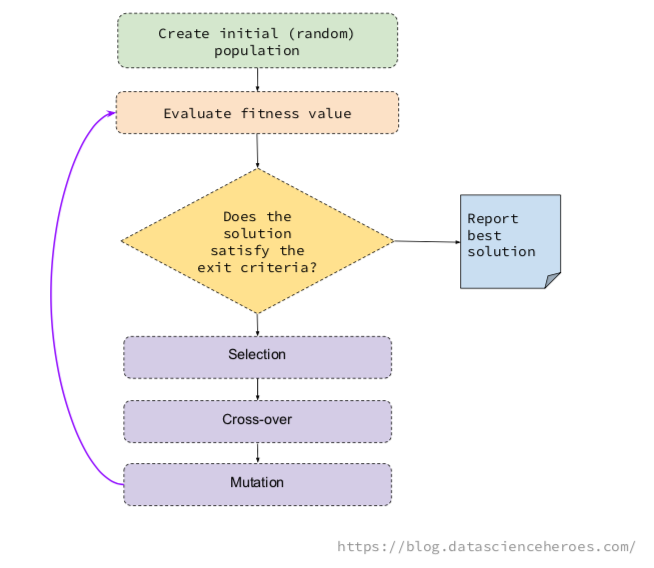 The fitness function takes a possible solution (or chromosome, if you want to sound more sophisticated), and evaluates the effectiveness of the selection. Normally, the fitness function takes the one-hot vector c(1,1,0,0,0,0) and creates, for example, a random forest model with var1 and var2, and returns the fitness value (ROC). The fitness value in this code is calculated as ROC value/number of variables. By doing this, the algorithm penalizes the solutions with a large number of variables. Similar to the idea of Akaike information criterion, or AIC. My intention is to provide you with clean code so you can understand how it works, while at the same time getting to try new approaches, like modifying the fitness function. This is a crucial point. The main library is GA, developed by Luca Scrucca. See the here for examples. Important: The following code is incomplete. Clone the repository to run the example. Blue dot: Population fitness average. Green dot: Best fitness value. Note: Don't expect the result that fast. The accuracy is around 95.08%, while the ROC value is close to 0.95 (ROC = fitness value * number of variables, check the fitness function). The author of the above post got a similar accuracy result using recursive feature elimination, or RFE, based on 5 variables, while our solution stays with four variables. Some configurations last a long time. Balance the classes before modeling and play with the p_sampling parameter. Sampling techniques can have a big impact on models. Check the Sample size and class balance on model performance post for more info. But the biggest similarity is both techniques come from observing the nature. In both cases, humans observed how neural networks and genetics work, and create a simplified mathematical model that imitate their behavior. Nature has millions of years of evolution, why not try to imitate it? I tried to be brief about GA, but if you have any specific question on this vast topic, please leave it in the comments.